Spending time with her son, the 40 year-old actress is happy to sleep just three to four hours a day. As Cantopop at 50 <流行經典50年> ends its run, a new parenting-themed program Healthy Baby <BB要健康> will be aired in the Saturday slot, hosted by Sharon Chan (陳敏之) alongside daddy celebrities, Bob Lam (林盛斌) and Yeung Chiu Hoi (楊潮凱). Sharing her own experiences on the show, the 40-year old actress admits that it is tiring to balance work and family commitments. 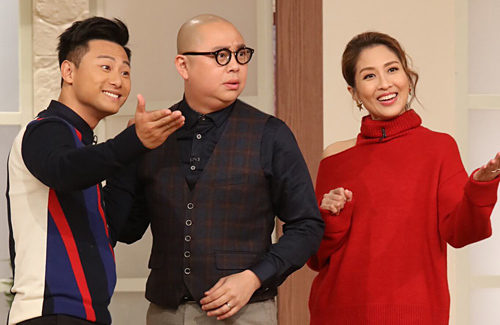 Starring celebrity guests such as Lai Lok Yi (黎諾懿) and Tracy Yip (葉翠翠), the program will share tips related to pregnancy, parenting and how to raise a healthy baby. With the three hosts sharing many personal experiences with the crew, they did not have to memorize strictly from a script and could talk more freely from their own experiences on the show. Earlier, Sharon’s son Eddie had contracted the flu. “At first I thought it was a normal fever, and gave him some medication, the next day the doctor confirmed it was the flu and gave him Tamiflu. I had to take his temperature every hour to monitor his condition as he needed to be hospitalized if the fever worsened,” shared Sharon. Luckily, Eddie recovered soon after medication. Being attentive to her son while fulfilling work commitments is no easy feat. Sharon said, “Using ‘tough’ to describe the experience sounds negative, I would say it’s tiring, but I feel really blessed and joyful too. Every day is spent meaningfully. I sleep for three to four hours, and am woken up by my son at 7 a.m. to be his playtime partner. After that, I have to do filming, hosting, and tend to my cookie business, so it is really exhausting!” However, Sharon is aware that many kids will stop allowing their mothers to hold them by the hand or kiss them around 10 years of age, so she appreciates the time spent with Eddie now. In the first episode of Healthy Baby, Bob and Sharon’s sons take genetic tests. Eddie’s results show that he is inclined towards sports, with a sociable personality and is well-suited for business. He is highly creative but lacks focus. As for Bob, he shared that his son is similar to himself with a lively and optimistic character, and is inclined toward sports too. Bob’s wife went on the program to share many incidents about their children. The actor was shocked that he is unaware of many things she discussed, and said he has decided to spend more time caring for his family.